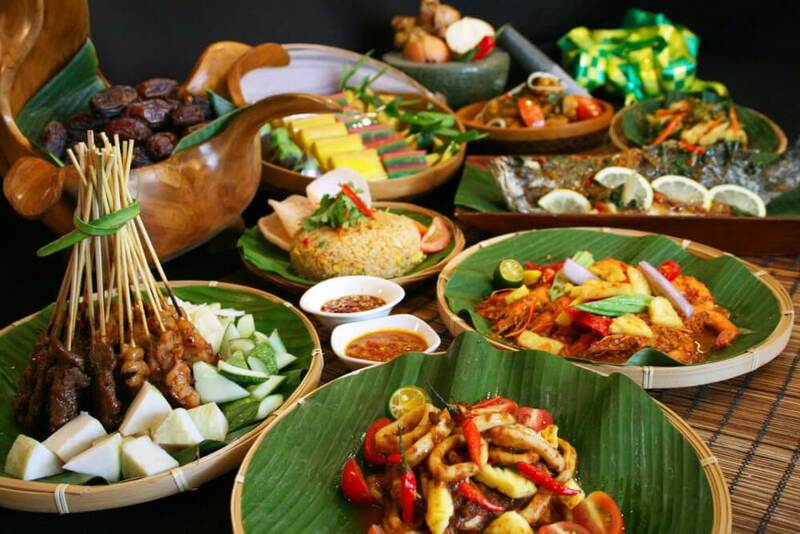 Malay food in Singapore can be described as a blend of traditional Malaysian dishes and influences from Java and Sumatra – the Indonesian islands. Rice is a staple, which is the same as in Chinese cuisine, largely because it is abundant but also because it contrasts well with spicy dishes to offset the heat a bit. Pork doesn’t feature in Indonesian or Malay cuisine for religious reasons. Belacan is a typical Malay ingredient, and this is dried shrimp paste. Combined with fresh chillies, it makes sambal belacan which can be added to a dish to give it extra flavour. Coconut is also popular and you can grate and squeeze the flesh of the coconut to make coconut milk which is then used in cakes, beverages, desserts and sauces. A lot of cakes will have coconut flakes sprinkled over them. The Malay cuisine in Singapore is a blend of traditional dishes from Malaysia with strong influences from the Indonesian islands of Sumatra and Java. Like the Chinese cuisine, rice is also the staple food, which acts as a “neutralizer” for the spicy cuisine. For religious reasons, pork is never used in Malay and Indonesian cuisine. Lemongrass, shallots, ginger, galangal and kaffir lime leaves are often added to dishes, and dried spices like tamarind, coriander, saffron, cumin and turmeric area also popular. There are some favourite Malaysian dishes, one of which is satay. Satay is prepared by skewering beef, mutton or chicken pieces and cooking them over charcoal. A sweet, thick peanut sauce is served over the hot kebabs, and sliced onion, cucumber and rice is served on the side. Beef rendang is another world-famous dish made by slow-cooking beef with typical herbs and spices. This is rich, sweet and hearty, and found all over Singapore. Nasi Padang also has Malay and Indonesian roots, and this can be any kind of spicy meat, poultry, fish or vegetable dish which originated from the Padang area of West Sumatra. Soto Ayam is good too, and that is a spiced chicken stock served with chicken, rice or potato croquettes, and beansprouts. For dessert, expect something rich in coconut milk, perhaps a cake or custard-type mixture. It is sometimes hard to distinguish what is authentic Malay, what is traditional Indonesia, and what is more Singaporean when it comes to food because a lot of dishes share so many characteristics. But all of it tastes good, and that’s surely the most important thing of all!